Garuda Indonesia budget subsidiary Citilink has further delayed the launch of scheduled international services as it focuses on its goal of achieving its first annual profit in 2015. Citilink will instead pursue less risky domestic expansion in 2015 and has begun operating seasonal international charters during periods of weak domestic demand. Citilink has been the fastest expanding airline in Indonesia over the past four years as it has pursued strategic growth in an attempt to close the gap with rival Lion. Citilink accounted for about 14% of passenger traffic among Indonesian LCCs in 2015 compared to less than 4% in 2010. But Citilink’s rate of expansion is slowing as it starts to focus more on profitability. Citilink was in the black for the first time in 2H2014 and is confident it can be profitable for the full year in CY2015. Citilink has been the fastest growing airline in Indonesia since 2011, when it took its first A320 and accelerated expansion as part of an attempt by the Garuda Group to compete more aggressively at the bottom end of the market against market leader Lion Air. Citilink was established back in 2001 but in its first decade operated a small number of 737s and had annual passenger traffic that never exceeded slightly more than one million. Citilink’s annual passenger numbers have increased seven fold since 2010, when it carried only 1.1 million passengers. Passenger traffic was up 41% in 2014 to 7.6 million, representing the fourth consecutive year of growth exceeding 40%. Citilink recorded 87% growth in passenger numbers in 2013, 76% in 2012 and 42% in 2011. Citilink is still much smaller than Lion Air but its rapid expansion has enabled it to narrow the gap. Citilink’s share of the Indonesian LCC market also has grown as a result of the Jul-2014 shutdown of Tigerair Mandala and capacity cuts at Indonesia AirAsia that were implemented in 2Q2014. CAPA estimates Citilink accounted for about 14% of Indonesian LCC passenger traffic in 2014. In 2010 it accounted for only a 3.7% share and was by far the smallest of Indonesia’s five LCCs. 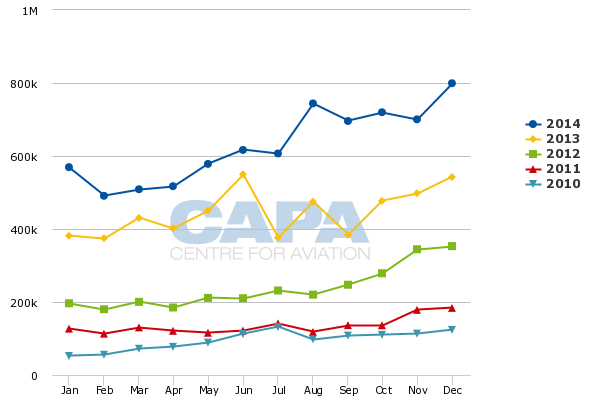 Citilink will almost certainly overtake Indonesia AirAsia in 2015 as the second largest Indonesian LCC. Citilink expects to carry about 11 million passengers in 2015 while Indonesia AirAsia traffic will likely remain flat at slightly less than 8 million as it is not pursuing any fleet expansion for the second consecutive year. Mandala initially suspended operations at the beginning of 2011. It re-launched in mid-2012 as a Tigerair franchise but again suspended operations in Jul-2014. All airlines in Indonesia are grouped by Indonesia’s DGCA into three categories – no frills, medium service and full service. Citilink, Indonesia AirAsia, the now suspended Mandala, Lion Air and Lion regional subsidiary Wings Air are the only airlines in the no frills category. The categories are used by the Indonesian government to determine fare ceilings and floors. The three categories are also used to determine what an airline can sell as an ancillary or must include with the base fare. Airlines in the no frills category are free to charge for checked bags, drinks and food. Citilink, Lion and Wings however have always included 15kg of complimentary checked luggage. Citilink has so far decided 0 against pursuing a pure LCC model because it feels it needs to match Lion, its main competitor. Indonesia AirAsia follows a purer LCC model and remains small in the domestic market But Indonesia AirAsia is the largest carrier in Indonesia’s international market, based on passenger numbers and seat capacity. AirAsia is continuing to focus primarily on Indonesia’s relatively underserved international market with the planned launch of long-haul LCC start-up Indonesia AirAsia X.
Citilink currently only operates scheduled services in the domestic market. Lion has a small international network consisting of only four destinations. Citilink launched its first international route in Mar-2014, a daily service from Surabaya to Johor Bahru in southern Malaysia. But as CAPA previously highlighted the route was cut after only one month. At about the same time Citilink decided against launching five other international routes which were part of the initial business plan for 2014 – Surabaya to Kuala Lumpur and Singapore and Bali to Kuala Lumpur, Perth and Singapore. Citilink initially pushed back the launch of services to Kuala Lumpur, Perth and Singapore until 1H2015. But Citilink’s new CEO Albert Burhan tells CAPA that the launch of scheduled international services has been pushed back until at least late 2015. Most likely Citilink will now renter the scheduled international market in 2016. Mr Burhan said the focus in 2015 will be on further domestic expansion as well as international charters. Citilink launched charter services to Saudi Arabia and China in early Feb-2015. Citilink currently operates three weekly flights from Jakarta to Jeddah with fuel stops in Medan and Mumbai. Citilink is committed to increasing charters to Jeddah to six weekly flights from 1-Mar-2015 and intends to change the second fuel stop from Mumbai to Ahmedabad. Citilink has also lined up contracts covering a total of 28 return charter flights to China in Feb-2015, the equivalent of one return sector per day. Mr Burhan says the commitment for China will reduce to 18 return flights in Mar-2015 as the number of Saudi Arabia flights spool up. Citilink has not had to reduce domestic capacity to accommodate the new charters as its fleet is expanding in 1Q2015 by two aircraft. One of these aircraft was delivered in Jan-2015, giving Citilink a fleet of 33 aircraft, while the second delivery is slated for Mar-2015. Citilink plans to increase domestic capacity in 2H2015 as the aircraft now used for international charters will be moved into the scheduled domestic market. Citilink also plans to add another three A320s over the last three quarters of 2015, giving it a year-end fleet of 37 aircraft. These three aircraft are slated to be delivered in May-2015, Aug-2015 and Nov-2015. Citilink is waiting until the second half of the year to pursue domestic expansion as demand in the Indonesian domestic market is typically stronger in the second half. Citilink is not intending to operate charters on a year-round basis but is keen to continue operating charters during off peak periods in the domestic market. Citilink is contracted to operate the Saudi Arabia charters until Jul-2015 while the China charters are currently contracted through Mar-2015. The charters are attractive as all the seats are completely underwritten by agents, guaranteeing a profit on every flight. It is generally difficult to be profitable in the domestic Indonesian market in the first half of the year. But with the charters Mr Burhan believes Citilink will be able to post a break-even result for 1Q2015 and be profitable in 2Q2015. As Citilink should be able to be profitable in 2H2015, the airline will likely end the year in the black. “My focus this year is to really make the airline profitable,” said Mr Burhan, who was promoted from CFO to CEO after former Citilink CEO Arif Wibowo was appointed Garuda CEO in late 2014. Citilink was consistently in the red from mid-2012, when it transitioned from a Garuda Group unit to subsidiary, through 2Q2014. Citilink accumulated losses of about USD100 million in its first two years as an independent subsidiary. Prior to mid-2012 there is no available financial information as Citilink operated at the time as a unit under Garuda. As CAPA previously highlighted, Citilink was in the black for the first time in 3Q2014 with a net profit of USD4 million. The Garuda Group has not yet released figures for 4Q2014 but Mr Burhan confirms Citilink was again in the black in the most recent quarter. The focus on the domestic market is sensible as the launch of scheduled international routes would represent a significant and risky investment. Domestic market conditions have improved significantly since 1H2014, when all Indonesian carriers were impacted by depreciation of the rupiah and political uncertainty. International services would almost certainly be loss-making, at least in the initial phase, jeopardising Citilink’s goal of positing a profit for CY2015. Profitability is important as it would make it easier for Citilink to pursue a potential spin-off and initial public offering. The Garuda Group, which completed its own IPO in early 2011, has previously stated it may look at a separate listing for Citilink at some point in the future. In 1H2014 the group attempted to secure a strategic investor for Citilink, which would have raised cash for expansion and brought in international LCC expertise. But the timing was poor as Citilink was unprofitable and market conditions in Indonesia were very challenging when Garuda solicited offers from Asian LCC groups and other potential investors. This impacted the value of Citilink, resulting in relatively low bids for the strategic stake, and the Garuda board concluded it was better off retaining its 100% stake in the LCC. Garuda is not currently considering a second attempt at a strategic stake sale. At this point it views a strategic sale as unnecessary and believes it can improve Citilink’s position without outside expertise. But Citilink will eventually need to reevaluate selling a stake in Citilink or pursuing an IPO. From a group perspective Garuda will also need to reconsider using Citilink in the international market. While it is sensible for Citilink to focus now on the domestic market and profitability this is not necessarily the best strategy for Garuda given the huge challenges the group faces in the international market. Garuda has been restructuring its international operation, which drove losses at the group in 2014 as yields and load factor dropped. Garuda has dropped two international destinations (Brisbane and Taipei), postponed the launch of three new international destinations (Mumbai, Manila and Nagoya) and reduced capacity to several international destinations (including Melbourne, Sydney, Tokyo and Osaka). More adjustments are expected as Garuda continues to review its international operation and increases its reliance on partners as part of an attempt to return to the black in 2015. Citilink could be part of the solution to Garuda’s international challenges as the LCC would be a more suitable option for leisure focused routes that are currently unprofitable at the full-service brand. But Citilink rejected proposals in 2014 from Garuda to take over some of these routes including Bali-Singapore and Bali-Perth. These were arguably the right decisions for Citilink, which is managed independently of Garuda and is able to make its own network assessments. The proposed international routes would also likely be loss-making for Citilink as the Citilink brand is not well known outside Indonesia, which makes it difficult for the LCC to compete in routes that rely heavily on inbound traffic. Bali-Perth and Bali-Singapore are both large routes for AirAsia, which has a much stronger international brand. Jetstar also competes in both these routes and entered the Perth-Brisbane market in 2014, making it difficult for Garuda to maintain its Bali-Brisbane service. Garuda operated its last flight to Brisbane on 1-Feb-2015. During the current phase of its development it makes sense for Citilink to focus on the domestic market and achieving profitability. But the group dynamic is a little different. Garuda now faces a difficult decision on whether to maintain several regional loss-making routes until Citilink is ready for the international market or retreat, leaving a void for other LCCs. Garuda also may need to withdraw from medium-haul routes that are more suitable for Asia’s growing crop of widebody LCC operators. The group strategically should look at handing some of its A330s to Citilink, particularly as Garuda now finds itself with excess widebodies. But the current domestic focus at Citilink means the group will likely not look at a widebody LCC operation for some time, again leaving an opening for other LCCs particularly Indonesia AirAsia X. For 2015 Citilink plans to focus mainly on expanding to existing domestic destinations through additional frequencies on existing routes and new point to point routes. Mr Burhan expects only one or two domestic destinations to be added in 2015. Citilink currently has a network of 22 domestic destinations covering western and central Indonesia. Citilink does not yet serve eastern Indonesia but believes eastern Indonesian markets are at least for now not thick enough to support LCCs. Citilink sees opportunities in 2015 to connect the dots with new point to point routes that are currently unserved or under-served. For example Bandung-Lombok and Pekanbaru-Palembang were both launched in mid Feb-2015. There could also be some opportunities in 2H2015 to add flights at both Jakarta airports – Halim and Soekarno-Hatta – but this hinges on additional slots becoming available. Citilink currently has about 60 daily flights in the Jakarta market, including about 20 from Halim and about 40 from Soekarno-Hatta. As CAPA highlighted in Aug-2014, Citilink had been hoping to increase operations in the Jakarta market in 2H2014 to about 90 daily flights by securing additional slots at both airports. But the additional slots did not materialise and Citilink instead expanded at its other bases. In addition to the two Jakarta airports Citilink has bases at Batam, Bali and Surabaya. The bases outside Jakarta could again see most of the expansion if additional Jakarta slots cannot be secured. Overall Citilink is planning ASK growth of about 30% in 2015, roughly matching the 33% growth in ASKs for 2014. The ASK growth in 2015 is mainly driven by capacity that was initially added in late 2014. Citilink took delivery of five A320s in the last four months of 2014. A total of eight A320s were added in 2013 with the other three aircraft being delivered around the middle of the year. The eight A320s added in 2014 included the first two aircraft from Citilink’s 50-aircraft order with Airbus. The A320 that was received in Jan-2015 also came directly from Airbus. The initial 30 A320s in the Citilink fleet were all sourced directly from leasing companies. But all the additional A320s in the Citilink fleet plan are now slated to come from its order with Airbus, including the four remaining deliveries for 2015. Citilink’s original fleet plan envisioned seven more leased aircraft in 2015 and 12 deliveries in total. Citilink earlier decided to slow down fleet expansion in response to unfavourable market conditions. Citilink currently has 12 more A320ceos on order along with 35 new-generation A320neos. Mr Burhan says Citilink now plans to take seven additional A320s in 2016 and its last A320ceo in early 2017. Citilink is also slated to take the first six of its A320neos in 2017, which will give the LCC a fleet of 51 aircraft (45 A320ceos and six A320neos) at the end of 2017. Mr Burhan says Citilink plans to take the last of the 35 A320neos it has ordered in 2021. The current fleet plan envisions a total of 71 aircraft by the end of 2021 including 35 A320neos and 36 A320ceos. Citilink plans to return nine of its leased A320ceos by the end of 2021 as their leases expire. Doubling the fleet over the next six years is reasonable given the opportunities to further expand domestically and – eventually – in the international market. This also represents a slower rate of growth compared to the last two years. Citilink has doubled its fleet over the last two years albeit on a much smaller base. Having significantly improved its position Citilink in 2015 will become the second largest LCC in Indonesia. It will never approach market leader Lion, which already operates over 100 aircraft, but has succeeded in narrowing the gap and gain market share. The current focus on profitability and the domestic market is well founded, giving Citilink a brighter outlook. But strategically Garuda will need to start looking at – sooner rather than later – using Citilink in the regional international market and potentially in the medium/long-haul sector. Newly appointed Citilink CEO Albert Burhan will be speaking at CAPA Fleet and Finance Summit in Singapore on 2/3-Mar-2015. For more information on the upcoming summit, visit the event website.